The U.S. Environmental Protection Agency did not justify increased spending on former Administrator Scott Pruitt‘s 24-hour security detail, which grew by almost $2 million in less than a year, the EPA’s watchdog said. “Failure to properly justify the level of protective services provided to the Administrator has allowed costs to increase from $1.6 million to $3.5 million in just 11 months,” the agency’s inspector general said in a long-awaited report on Pruitt’s 24-hour protective detail released Tuesday. 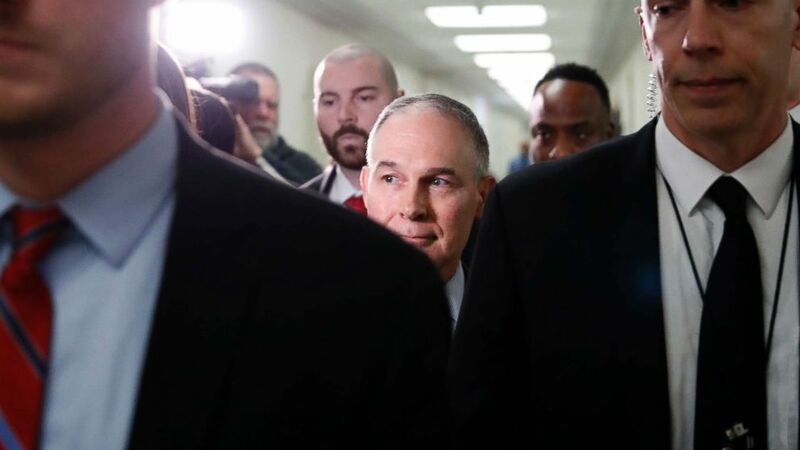 As Pruitt came under scrutiny before his July resignation, whistleblower testimony and information obtained by Democrats questioned whether the EPA inflated threats against Pruitt to justify increased spending on security for the administrator without proper explanation. The report, which the EPA challenged after its release, found that the agency’s protective detail has no process to address how much protection the administrator should have or how to carry out that protection. The EPA Office of General Counsel provided a legal opinion that the EPA can legally protect its own administrator, the inspector general said, but adding that the Government Accountability Office says only the Secret Service and State Department have statutory authority to protect Cabinet members. The EPA made the decision to implement 24/7 protection for Pruitt prior to his arrival and without a proper threat assessment, according to the inspector general’s report. “The failure to have effective and current standard operating procedures can result in the organization having unclear lines of authority, inconsistent practices, inappropriate or inadequate staffing, and excessive or unnecessary costs,” according to the report summary. For example, the protective detail incurred over $3.5 million in costs from February 1, 2017, through December 31, 2017—an increase of over 110 percent compared to the prior period’s costs of $1.6 million— without documented justification,” the summary said. The EPA pushed back on the report Tuesday, saying in a statement from an agency spokesperson that it disagreed with the method outlined by the inspector general for determining the required level of protection for the administrator. Pruitt’s predecessor, Gina McCarthy, did not have 24/7 security but utilized a “portal-to-portal” security method where she would receive protection on her commute to and from work. Pruitt’s replacement, Andrew Wheeler, requested in July that 24/7 security be replaced with the portal-to-portal method, the report said. The inspector general recommended that EPA implement new rules about how much time its enforcement agents should spend investigating environmental crimes, that EPA complete a regular threat analysis to identify the proper security protocol for the administrator and that it write uniform policies for the protective detail.